You must make reservations at least 5 minutes in advance of the time at Thai House Restaurant - Danville. Thai House is a restaurant dedicated to serving authentic cuisine from all over Thailand. The inside of the restaurant is tastefully decorated, with plenty of Eastern inspiration in the decor and place settings. There are also several plants placed throughout the restaurant giving it a lush and vibrant feel. Each table gets a different centerpiece of flowers as well. Thai House's menu hits all the best parts of Thai cooking. The signature appetizer on the menu is the pu-ja, a plate of Dungeness crab meat with ground chicken and Thai herbs that have been deep fried and served with spicy and sour sauces. As for entrees, the number one seller is the Thai pumpkin curry with scallops, chicken, prawns and bell peppers in a curry broth with fresh basil. Great Thai food in downtown Danville. Service was very good as well. Highly recommend this restaurant. My husband and I made a Friday night dinner reservation, and had to wait 10 minutes to be seated disputed arriving on time. After we were seated it was another 20 minutes before anyone took our order. The food was excellent, but I would not recommend dinner here on the weekend unless you have lots of time and don’t mind waiting. May be a better take out option. We had not been to the Thai House in several years. Surprisingly the quality of food was there. We order 3 dishes and 1 appetizer. My wife enjoyed all 3 mains while I only cared for two. The duck dish was not a favorite of mine. I thought the cooking was good but something was missing. Found out Sam the chef was off the day we visited. Would I return, the answer is yes. Very good Thai food in a nice setting. Family owners are great people and always willing to assist. It was a lovely birthday dinner. I brought a cake which the restaurant served. They also prepared a special dessert. Service and food were wonderful. They were so accommodating. We enjoyed our dinner. Diner with 6 people. We all enjoyed our dinner. Ambience is lovely and we were able to talk without disturbance. Highly recommend. What a gem! We came here after a horrible experience at Dana’s on Valentine’s after waiting an hour after our reservations and still being ignored. I called them and despite being busy they said they would accommodate us. When we arrived, it was a cozy little establishment. We were instantly greeted. Everyone was warm and friendly. The restaurant was full. We were seated in 10 minutes. We were greeted by the waitress within five minutes. I ordered a wonderful lobster and scallop dish, My husband ordered his favorite Tom yum soup with catfish and My daughter ordered the Tom Yum soup with chicken. My daughter said her soup was delicious and I tried some and totally agree with her. I didn’t get to try my husbands because his was so good that he gobbled it up before I even got to it! Mine was very tasty. We did not feel hurried but was able to get there, eat, and be on our way home in little over an hour. This was about the same amount of time that we waited after our reservations at Dana and still did not get seated. Now that I look back, I’m glad we had a horrible experience at Dana’s because we would not have found this great restaurant. We will definitely be back many times. Everything was great except they were a little understaffed for the Valentine's Day Holiday. Service was attentive but a bit slow. The only other concern would have been that they lost our Open Table reservation but ended up taking us on a busy holiday anyway. My friend and I went to Thai House on Valentines Day. Due to a miscommunication with each other I cancelled our reservation at the last minute because I thought my friend had forgotten and I couldn't reach her. 10 minutes after we were supposed to be there she arrived at my house. I quickly called the restaurant and they graciously agreed to reinstate our reservation and delay our time slot. Because we were close by we arrived within about 10 minutes. We were seated immediately. The hostess was warm and welcoming. Our order was taken and our food arrived quickly. And it was delicious! The prices of the food and wine were very reasonable. I will definitely go back soon! Restaurant is very cute. Noise level was low: something I rarely find anymore. Food was delicious and fresh. Staff were pleasant and attentive. Prices were very reasonable. Restaurant was recommended on Michelin Guide. Worth the drive from Concord. Will visit regularly. I've driven by this restaurant for years but for some reason never ate there since it's been a Thai restaurant. I'm not sure why I decided to eat there this time but I'm so glad I did. It was a Sunday night which may have been why it was quiet. The hostess was thoughtful in seating the diners at tables away from each other which made it nice for conversation. The food was excellent with beautiful presentation. The service was also excellent. The waitress paced the food delivery between appetizers so it was a relaxed meal. Both my daughter and I said we'd definitely go back to the Thai House. We've lived in Alamo forever, and had never heard of Thai House. Found it here on OpenTable, and were happy that we did. The setting was wonderful -- small, quiet, bordering on elegant. The food was very good. Not totally off-the-wall the best Thai food I've ever had, but very very good. Service was good. It was maybe just a tad pricier than some other Thai places, but not too bad. I highly recommend the Thai House! Love this place. Small converted house off the main drag. The food is great and the service is as well. Food is delicious but service needs improvement....meals are delivered randomly to the table so we waited over 10 minutes for others at our table to be served. Better coordination with the kitchen is necessary - this has happened before so there is no improvement. Food was great. And they even gave us a complimentary ice cream since it was our anniversary. confused hostess re open table reservation, 15+ minutes to take order, 1+ hour to get food, sizzling hot plate was wet sauce and not sizzling, and bland. Pad Thai noodles all broken and also rather bland. Very very disappointed, will not eat there again. Great local thai restaurant that is family owned and been in Danville for years. We have been many times and always well served with authentic thai dises that are wonderful. They rotate specials every month that are qorth trying alongside your thai staples. It's nice to know there is a Thai Restaurant close by in Danville. The service was excellent and lots of different food to try. Prices were very reasonable. 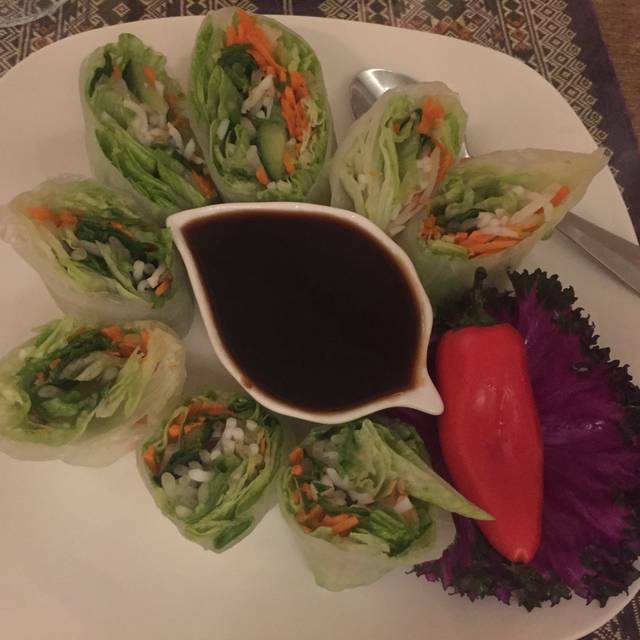 We loved the ambiance of a homey feeling , tranquil atmosphere where we could hear one another .Enjoyed the vegetarian options ,the staff were very accommodating and caring about our dietary preferences. Would recommend it highly ! Even though we had a reservation we waited 40 minutes before the waitress came to take our order. We were there at 6:15. There was a large party, as well as a few other tables. There were only two waitresses, and while trying to serve the restaurant patrons, they were also taking care of the MANY to go orders. These to go orders appeared to take priority over the seated patrons. We had two young children. The food was good, but the service was not. If I went again I would order to go. The two couples seated next to us left after not having a waitress come by for 15 minutes. Too many other good restaurants to pay for bad service. Our hands down fav Thai restaurant in Danville...Michelin stared, great service, large quantities & always a memorable meal. Truly disappointing. Over booked, understaffed. Maybe holiday season blues. Not good. Slow service, but quiet ambience, interior like home, and able to converse easily. Nice change from most restaurants. Food choices are significant. Flounder dish excellent. We have finally found the best Thai restaurant in the area after living here for 4 years! Our meal was delicious and service very friendly. We will definitely go back! As usual, the food at the Thai house is awesome. A nice evening, outdoor dining, hard to beat that. it all. it is small and cozy/intimate. (although it can accommodate a larger group. A table in the same room had approx 8-10 people. were closing down. The server not only made and brought it but graciously allowed us to remain there even though it meant waiting on her part. It was really above and beyond. I am very appreciate for the total experience and hope this true review helps. We wanted to try this Thai spot again after going to an outstanding Thai place in Kona. Had forgotten just how good the Thai House was . I plan on going back much more frequently in the future. Our favorite local Thai restaurant. Love the food and the staff has always been friendly.